We’re tapping 12+ years of experience, working at neighborhood dog kennels and volunteering at the local veterinarian’s office – plus our own experience as dog owners, to share with you the most important information on heated dog beds today. What Kind of Dogs Are a Good Match For These Heated Dog Beds? These heated beds are most suited to older dogs with health issues like arthritis. Any dog that could benefit from the therapeutic effect of a warm bed would love to lie on the 5 beds we review in this article. Dogs with shorter hair are more prone to losing body heat and can therefore benefit from an electric, heated bed. It’s also a good choice for young puppies. They can also benefit from a heated bed because they’re not capable of self-thermoregulation at such a tender age. Any small and cold-sensitive dog can also benefit from the added warmth of these beds, as would dogs who live in particularly cold areas. Well there are many options when it comes to a heated bed, we’ve narrowed the field to five we think are the absolute best. Choose the style that suits your dog and give them the gift of a comfortable sleep. This bed is clearly it’s a favorite among buyers in the marketplace. And while the Snoozer may not be suitable for all dogs, it’s ideal for those who love to burrow under blankets or pillows. There’s a wide range of sizes available, so virtually any breed of dog that likes to nest can find comfort within the cave-like setting of the Snoozer. Its faux lambskin interior provides both warmth and comfort while your dog naps or sleeps. The outer cover easily unzips and is machine washable. Since the Cozy Cave is a partially enclosed dog bed, you want to make sure you get a size that provides ample space for your pet. They can be tucked inside as though they’re in their own bed with a cover on top. But don’t take it outdoors. This bed is designed to only be used inside. Taking it outdoors and exposing it to the elements will only age the bed prematurely. Materials are top-quality and attractive. 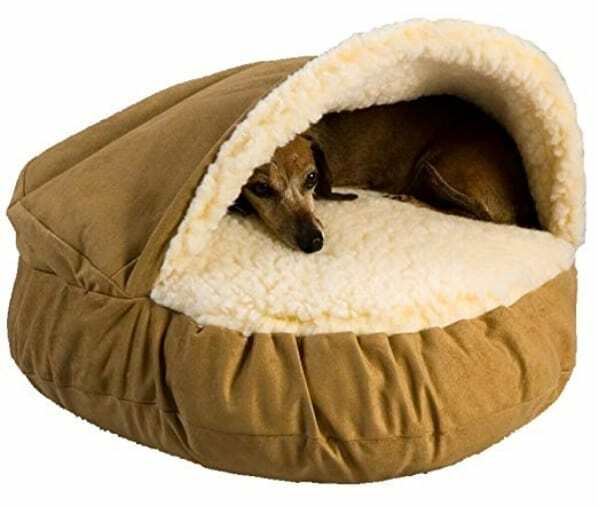 For dogs who like to burrow or be covered as they sleep, the Cozy Cave is a good choice. It’s washable. Being able to regularly clean the outside of your dog bed is important. Heavy-duty brass zipper. The strong zipper in the back allows you to easily remove the cover from the mattress which is helpful for cleaning purposes. And it will never rust. Luxurious removable cover. Made from micro suede, this comfortable cover is removable and is both machine washable and dryable. Faux fur falls out. The inside lining tends to shed, although the process of shedding dissipates as time goes on. But for the first couple of weeks, some padding will loosen. It’s not the strongest sewing job. One buyer noted that the sewing is less than perfect. Seems are not perfectly gathered and zippers are not perfectly sewn. This leaves the potential for problems later on as either the zipper or the fabric gives out. Most dogs don’t like it. There’s no question that this bed is cozy. But it takes some dogs little bit of time before they get totally comfortable with their new cave. Others prefer an open bed. Why is this not the normal heated dog bed you would expect? Because it is not heated which is obvious if you have read this far. However from thousands of satisfied customers it wins hands down for it’s design and special features. You won’t find any heated dog beds made like this one. The Cozy Cave Snoozer is unique in that it’s internal heating comes from the Sherpa lining from top to bottom for maximum heat distribution. If you treat your dog like part of the family and love him or her, this best seller is our top recommendation. This one of a kind dog bed will keep your loved one warm throughout the year. Seeing their serine smile while they curl up and resting their under neck on the Sherpa lining will make you fell warm and cozy yourself! The winner in the best value for money category is the K & H Pet Products Lectro Soft Outdoor Heated Bed and it’s available in 3 sizes. The Lectro Soft bed from K&H is extremely popular with dog lovers who want to ensure their pets stay warm on those cold winter days and nights. It’s thermostatically controlled. As your pet lies down, the bed warms to his or her normal body temperature. Surprisingly, it does so by using only 40 Watts of power. This means it uses less electricity than a night light. Think about that for a minute and let it sink in. With such low power, your operating costs are next to nothing. It’s energy efficiency through conservation. I doubt you’ll notice any real increase on your electric bill. But your dog will certainly notice an improvement in the comfort level of his sleeping quarters. If your dog is used to sleeping in a doghouse, garage, workshop, barn, or shed – or any other sheltered area – this bed could be a match made in heaven. It’s also ideal for kennels, or for dogs that sleep in basements or on porches. K & H offers a one year manufacturer’s warranty. This bed is MET listed for safety – meaning it meets or exceeds all safety requirements in the United States and Canada. 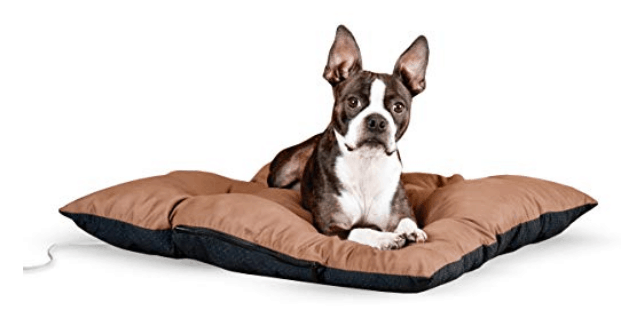 It’s the first heated dog bed designed for outdoor use to also contain soft, orthopedic foam inside. Its rugged construction ensures repeated use indoors or outdoors. Since the exterior is made of a PVC material (a plastic) – it won’t absorb moisture. It’s also easy to maintain with a fleece cover that’s 100% machine washable. 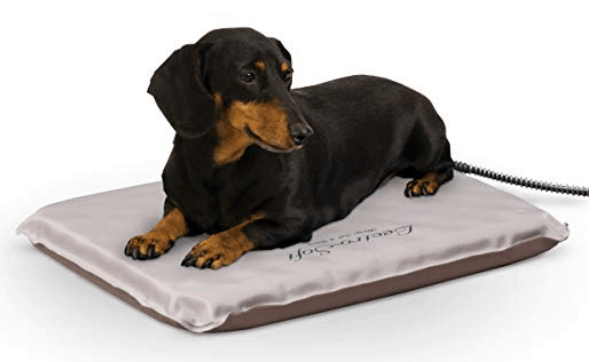 This heated bed keeps your dog feeling secure and warm – whether they sleep indoors or outdoors. It’s the only heated bed made of orthopedic foam on the market. So if you’re looking for your dog’s bed to do double duty – take a closer look at this one. The exterior consists of a soft, waterproof and surprisingly durable PVC material. Being able to use it indoors or out gives you added flexibility. It’s also lightweight and easy to transport wherever you want. The power cord provided is 5 1/2 feet long (that’s about 2 feet longer than many power cords) and it’s wrapped in steel coil – making it virtually chew-proof. Interesting to note is that the temperature of this model will never exceed the temperature of your dogs body – whether it used indoors or outdoors. And this bed still works well in the cold. According to the manufacturer, the Lectro Soft Outdoor Bed can be used effectively in temperatures as low as 20° below zero. If your dog loves to chew, this is not the bed you should be buying. Chewing and electricity do not go hand-in-hand and they never have. In most cases, this won’t be an issue on the most visible target – the power cord – simply due to the added protection of steel casing. But a determined chewer could destroy the bed itself by shredded it into pieces exposing wires and the heating element. Cleaning is easy. The best way to clean the K & H Lectro Soft Outdoor Heated Bed is simply unplug it and wipe it down using a wet rag. It’s important that you allow it to completely dry. The best way to dry any dog bed is in the open air outside – preferably on a bright, sunny day. How Does The Heating System Work? It’s clear to me that this product is well made. K&H has a legion of fans and undoubtedly, this is due in part to the durability of their products. Since the bed is thermostatically controlled, you don’t have to manually turn it on and off. Just leave it plugged in and it will turn on and off automatically, as needed – so you’re not using any extra electricity unnecessarily. It’s only operating when your dog is lying on it. When he steps off the bed, the heat simply dissipates into the air. Plenty of experienced veterinarians have recommended this bed to their clients. After all, the warmth it generates is nurturing to an ailing dog. An internal thermostat keeps the temperature at a desirable 102°F when your pet is lying on the bed. Once they step off, the temperature drops to just about room temperature – or slightly above. It’s important to use this and any other electric dog bed according to the manufacturer’s specifications. This means using the bedding cover exactly as provided and not adding any extra blankets, pieces of fabric, straw, hay, wood shavings, or anything else. In fact, it’s a good idea to make sure your heated dog bed is clear of all other combustible materials. It’s safe. There’s no real fire hazard under normal use – since this is a low wattage device and the heat produced is a very low heat. It’s also grounded with a three prong plug. It does warm up though and works with the animal’s own body heat to keep them snug. Good for kennels and breeders. This works great to keep young puppies warm as they grow and develop. Works indoors and outdoors. Multifunctional design allows for both outdoor and indoor use on a flat hard surface. Safety coated cord. The power cord is protected with the steel coil coating, making it less likely your pet will attempt to chew it. It takes time to warm up. Allow15 to 30 for it to warm up minutes after plugging in the bed. Loose Cover. One buyer suggested the outside cover may be loose and come off a little too easily. Cover lacks elastic straps. Instead of securing the cover to the bed with elastic straps to hold it in position, it comes equipped with a pocket. The problem is that these pocket type covers tend to be more difficult to get on, particularly after washing and drying. It tends to get a little overly snug and causes a slight curve in the bed. But this flattens out when the dog gets back on it. Who Is This Dog Bed For? Setup is super easy. And this bed is actually quite rugged. With an outside shell made from waterproof PVC material and an electric cord wrapped in a protective metal coil this bed should serve buyers well. This is a top class bed, but it really depends on the type of dog you have. Older dogs living in colder climates tend to prefer this bed over others. And some dogs require more artificial warmth, while other dogs manage quite well without it. The Deluxe Electro soft outdoor heated bed is actually an upgraded version from K&H’s original electro soft outdoor heated bed. The primary upgrade is that in this Deluxe version – there’s a soft, comfortable bolster on all four sides – providing added comfort for your dog and while helping to block out any drafts. Choose from three sizes – small, medium, or large. This is another bed worth checking out that can be used indoors or outdoors that features soft padding and a bolster. If your dog sleeps in the garage, enclosed porch, doghouse or barn, you might want to consider getting a warm bed like this one. There’s an internal thermostat that warms to your dog’s temperature, and the cover is soft and comfortable. It’s also MET listed, so you can rest assured knowing that it meets or exceeds all safety standards in both the United States and Canada. When your dog needs not only a little extra warmth, but soft cushy comfort too – this may be the bed to consider acquiring. Its built-in temperature gage keeps the bed at a comfortably warm temperature, without ever overheating. For a through cleaning, combine manual wiping and machine washing. On the K&H bed, the exterior bolster cover is a brown nylon type material that requires manual cleaning. This task is easily handled with a damp sponge or cloth. Air dry it outside – preferably in direct sunlight. The fleece cover that fits over the heated pad in the center of the bed and is removable. So it can be machine washed in cold water. It’s recommended that you air dry the cover as well and avoid applying heat (other than sunlight) during the drying process. Although this bed is perfect for any kind of covered area, including porches, garages, barns, sheds, and warehouses – you will need to have electrical outlet nearby. Simply plug it in and let the bed warm up. It emits a slight amount of heat and it is this limited heat that will attract your dog to it. Dogs can sense the slightly warmer temperature and are drawn towards it for comfort. The heat is minimal – just enough to make it comfy for your dog. Not too much where they would have to step off the bed if they felt overheated. That doesn’t happen with this dog bed. So your dog can sleep soundly, for a longer period of time. As soon as your pet steps off the bed, any additional heat that was generated to keep them warm soon dissipates into the air. At this time, the bed returns to its normal setting – just above room temperature. As a general rule, this heated dog bed should be plugged directly into a wall socket. If you have to use an extension cord, it’s imperative for safety reasons that you choose the right kind. Just because you can plug it in and it fits, doesn’t mean it’s a safe cord to use. Find an area close to an outlet, or consult a professional electrician. Because it’s an electric appliance, it’s not recommended that you add an additional blanket on top. It’s important that this bed only be located in a covered and protected area, so it stays dry. Exposing any electrical device to the elements will surely ruin it. Why Would This Dog Bed Suit Your Dog? For dogs who sleep outside of the home (but in a sheltered area) this bed provides just enough warmth to keep the chill off on those cold days and nights. First and foremost you want to make sure that you get the right size dog bed for your dog. That can make all the difference in their level of comfort. Another factor is to consider where you’re going to be placing the bed. It’s always better to choose a higher quality bed than a lower quality one that you know you’re going to need to replace before long. The more durable and comfortable the bed, the more value you and your dog will ultimately get from it. This is one of those beds that has a more traditional look with its rectangular shape and plush padding. But it also includes some pretty cool technology that makes it toasty warm for your pet, without ever getting too hot, so it’s totally safe to use. What makes this bed a hit among buyers is the soft cushy sleeping surface that can go anywhere inside the home. You can pick it up and place it anywhere and it will still look good as the mild heat it generates will provide cozy comfort for your dog. And it’s easy to throw in the washing machine. It’s important to note that this K&H bed is not made for outdoor use. The low wattage of the electrical component included means that the heat generated is mild and not sufficient to counter the cold outdoors. It is MET listed, so it meets or exceeds all U.S and Canadian safety standards and it does come with a one year warranty. But it’s important to keep this bed inside while in use. Plug it in and the surface temperature of the bed will rise to somewhere between 12 and 15 degrees above the ambient room temperature. You may not notice it as warm to your touch. But when your pet lies down, the surface temperature will rise to about 102 degrees, which is ideal for your dog (or cat). It’s available in 3 sizes and 2 colors – chocolate brown and sage green. The small model measures 19 inches by 24 inches, medium – 26 inches by 29 inches, and the large size is 36 inches by 38 inches. Machine washable. Simply unplug the cord and remove the heating element from its zippered enclosure. Then toss the whole thing (minus electrics) in the washer in cold water on a gentle cycle. Air dry on a clothes line, or use the no-heat setting on your dryer. Warms just enough. Dual thermostats help maintain the temperature about room temperature. But once your dog climbs aboard, that temperature climbs to a comfortably warm 102 degrees Fahrenheit. Once they step off, the temperature drops back down again. Great for older dogs. Since this bed features a flat, cushiony design, it’s older for older, ailing dogs to get on and off, without any difficulty. Safe to use. You never have to worry about the bed heating up excessively, or drawing any extra power, despite the fact that it’s an electrical device. Can get lumpy. During machine washing, the filler material moves around and clumps together, creating an uneven surface and requiring your to manually to manually break up those lumpy areas. For arthritic or aging dogs, this bed is a good fit. The fact that it comes from a well-established brand like K&H means you can buy with confidence. While the cover is made of 100% polyester, it may not be rugged enough to stand up to the use of some dogs who can be harder on their sleeping quarters than others. Some buyers mistakenly thought the bed wasn’t working properly and therefore gave it a low score. The thing is, this bed does work. But it’s difficult for humans to feel the heat this bed generates. But dogs who like the K&H heated pet bed – really like it. It’s the comfort they love – with just the right amount of heat for a dog (even though it may be barely noticeable to you). Somewhere on our shortlist is the perfect bed for your dog. If your dog is a nester, choose the Cozy Cave and let their own natural heat keep them warm. 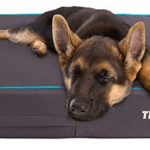 But if your dog prefers a more open sleeping experience, and you appreciate getting the most value for your money, we recommend this heated dog bed. Another solid choice is this warm dog bed. You can save yourself hours of research and untold frustration by simply choosing any one of our recommendations. Why Consider a Heated Dog Bed? 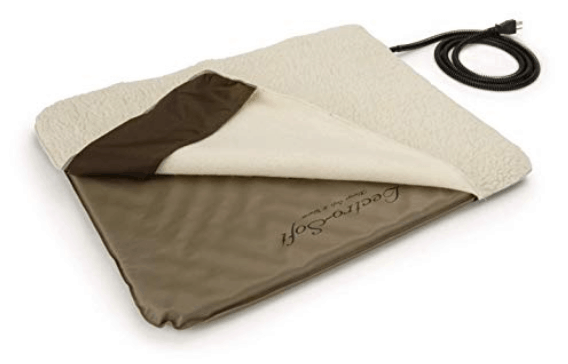 The warmth generated from heated mats or dog beds helps increase circulation, which in turn promotes healing in deteriorating joints and muscles. Creating a comfortable environment for your dog and keeping them snug, so they can sleep all night long – as nature helps relax and restore their bodies. Heated beds are particularly helpful for senior dogs who don’t have the same level of health they had in their younger years. 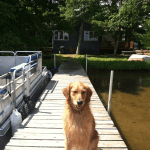 Any dog with health issues such as arthritis, spinal or leg injuries, circulation issues, hip dysplasia – or any other health condition that affects their joints and mobility – is a prime candidate for a heated bed. There’s nothing quite as comforting as warmth. It helps ease pain and discomfort. You can also get orthopedic versions of heated dog beds to provide additional support as well as comfort. It’s a good idea to pay particular attention to the temperature of the heated dog bed. Dogs that have difficulty moving around maybe reluctant to get up off a warm bed even when it reaches uncomfortably high temperatures. Heated dog beds are also ideal for smaller dogs and those without much fur. Dogs that don’t have the thick coat of a German Shepherds or Siberian Husky could definitely benefit from a heated bed. 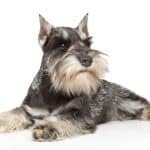 They’re also especially good for dogs that spend most of their time outdoors – or away from away from the primary residence. 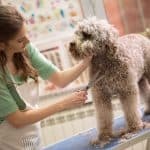 This could include dogs that stay in garages, barns, workshops, industrial units, or sheds. As temperatures drop, you want to make sure that your dog is protected and comfortable. And of course, the older your dog gets the more it’s important it becomes to keep them toasty warm, since other health issues affect their level of comfort and quality of life. How Safe are Heated Dog Beds? All dog beds we recommend are safe. Beds designed for dogs are much safer than using a heated blanket designed for human use. Heated dog beds are engineered to warm up to a safe temperature only. This is something that those electric blankets simply don’t do. Electrically powered heated dog beds operate on a low wattage, which conserves energy and is extremely safe. There are two types of dog beds – electrically heated and self warming. Electric beds usually need to be plugged into an outlet on the wall. Self warming beds use your pet’s own body heat to generate comforting warmth. Both work well. But electrically heated beds tend to get slightly warmer and they provide just the right amount of heat to deliver added warmth when needed. Self warming dog beds use thermo-reflective liners to reflect heat and direct it back towards the dog. Instead of losing that body heat, they’re able to use it to keep themselves warm. These beds are a little easier to wash and don’t require power sources – so they can be used anywhere. Mark Hastings loves his dog and 2 cats. He and his dog Jake regularly go on adventures to the beach which is Jake's favorite place to explore. He likes to spoil his pets for a happier healthier life. 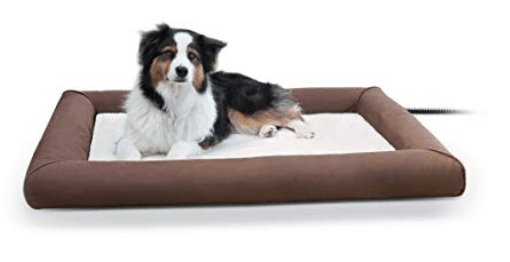 PrevPreviousThe Ultimate Orthopedic Dog Bed To Keep Your Dog Happy! 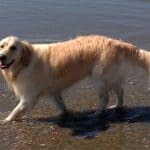 Copyright © Your Playful Pets 2019 - As an Amazon Associate I earn from qualifying purchases.